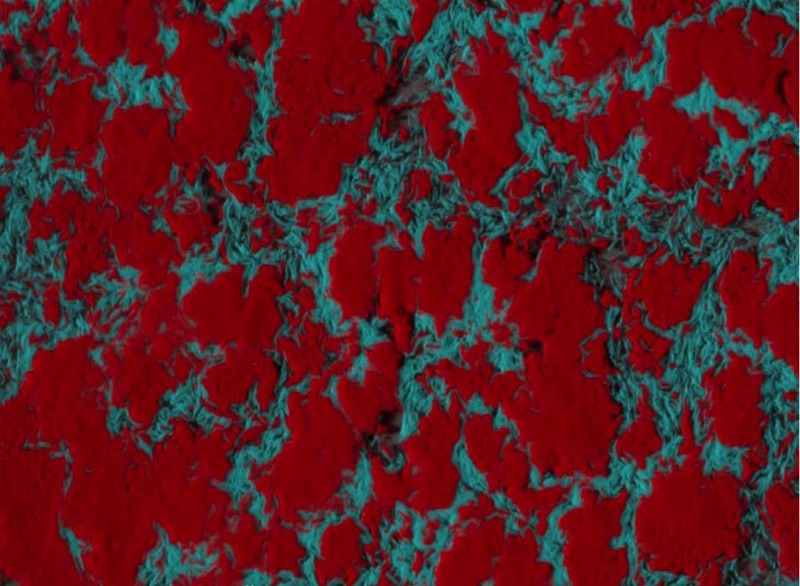 This is a synthetic microbial biofilm community built from a cyanobacterium, Synechococcus PCC 7002 (red), supporting a metabolically engineered “biofuel catalyst” strain of Escherichia coli (blue). PNNL researchers and collaborators examined the state of the science for bioengineering to determine how microbial multi-species consortia can be more successful in developing biotechnologies for renewable energy. Imaged by H.C. Bernstein. Enlarge image. These new perspectives stemmed from a panel at the 15th International Symposium on Microbial Ecology in Seoul and appear in the International Society for Microbial Ecology's (ISME) official publication, The ISME Journal. Why It Matters: Agriculture has long known that monocultures, or growing only one type of crop, can be susceptible to changes in the environment. For example, relatively small or poorly timed changes in rainfall can cause major losses in production for some crops. In contrast, growing several crops with different tolerances to drought might more stably provide food, no matter the weather for a given year. The same principle applies to microbes, which are drivers of global geochemical cycles and catalysts for renewable fuels and chemicals. Microbial communities can prove to be more reliable than engineered "superbugs" and more robust against unpredictable environment than individual microbes. This reliability is the key to using them for industrial purposes. "The promise that this field has to offer is great," said Beliaev. "Transformative biotechnologies will help overcome the energy, health, and environmental problems of the future, and the process of learning to design and control ecological phenomena has and will undoubtedly continue to yield new insights on the fundamentals of life." What's Next? PNNL's microbial research program continues to expand the foundation of biological systems design. Ideally, advances in this field will allow scientists to control safety, productivity, and stability of natural and designed microbial ecosystems. Sponsors: The U.S. Department of Energy's Office of Science, Office of Biological and Environmental Research, supported this work via the Genomic Science Program under the PNNL Foundational Scientific Focus Area. MWF is supported by the Scientific Focus Area Program at Lawrence Berkeley National Laboratory. HCB participated with support from the Linus Pauling Distinguished Postdoctoral Fellowship, a Laboratory Directed Research and Development Program at PNNL. Reference: Lindemann SR, HC Bernstein, H-S Song, JK Fredrickson, MW Fields, W Shou, DR Johnson, and AS Beliaev. 2016. "Engineering Microbial Consortia for Controllable Outputs." The ISME Journal: Multidisciplinary Journal of Microbial Ecology. Advance online publication 11 March 2016. DOI: 10.1038/ismej.2016.26. In 1 sentence: The ability to engineer microbial ecosystems for biofuel and other uses will require understanding mechanisms driving microbial community function only possible from combining recent advances in systems biology, computational modeling, and synthetic biology. In less than 150 characters: The time is ripe to design and control microbial communities to make biofuel and more by combining systems, computational, and synthetic biology.